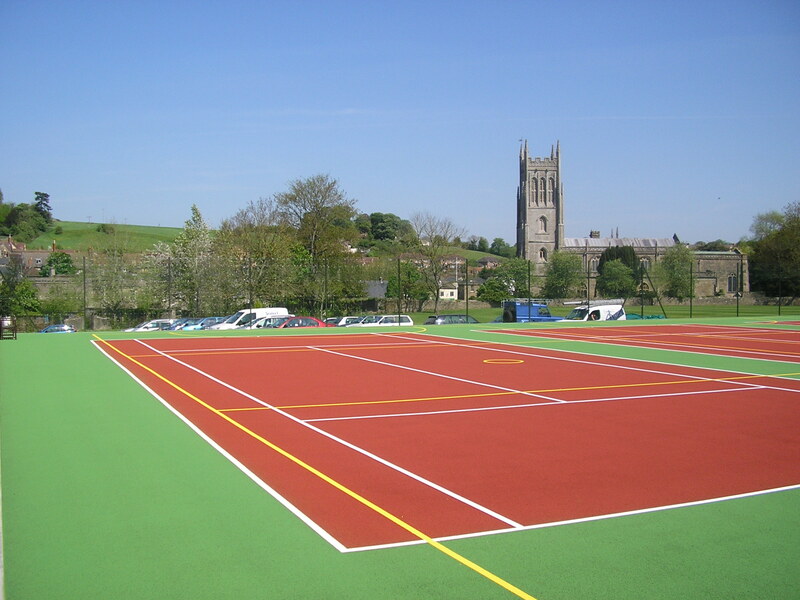 Sports and Safety Surfaces are one of the leading providers of MUGA Services in the UK. For over a decade we have been serving our customers with top class installations at really competitive pricing. These facilities are often installed at schools and local clubs as they provide diverse sporting opportunities for users. 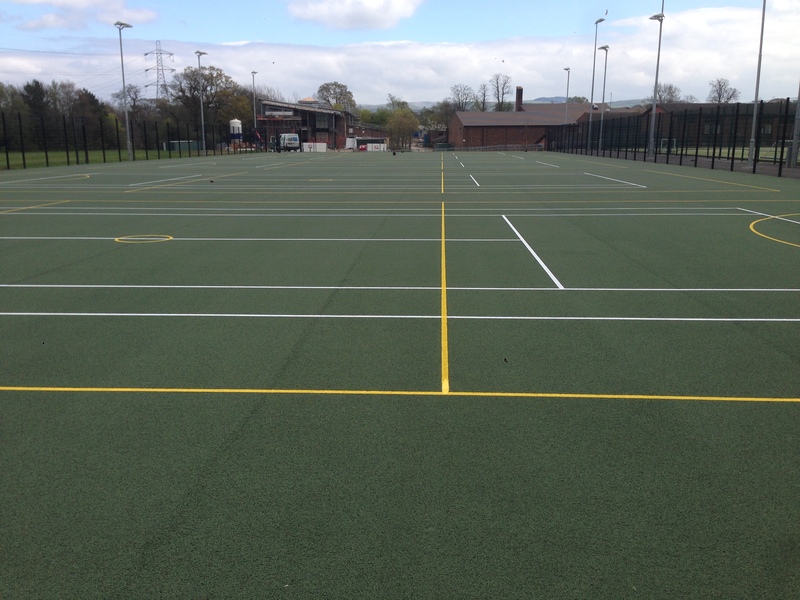 We have a number of MUGA services available to ensure that your leisure centre, club, school or college has a great quality sports surface. Feel free to contact our specialists today if you need some more advice on what is available and the services we offer. What Does MUGA Stand for? MUGA is an abbreviation of the phrase Multi Use Games Area. This is a type of sport facility commonly found in schools and local clubs. We are able to install these facilities at many locations including schools, colleges and leisure centres across the UK. Feel free to get in touch with us today if you have any questions about our MUGA services or if you’d like a quote for construction of a sports facility. A MUGA, as the name suggests, is a multi purpose facility that can be used to play a variety of sports activities, and these will usually be found outdoors. 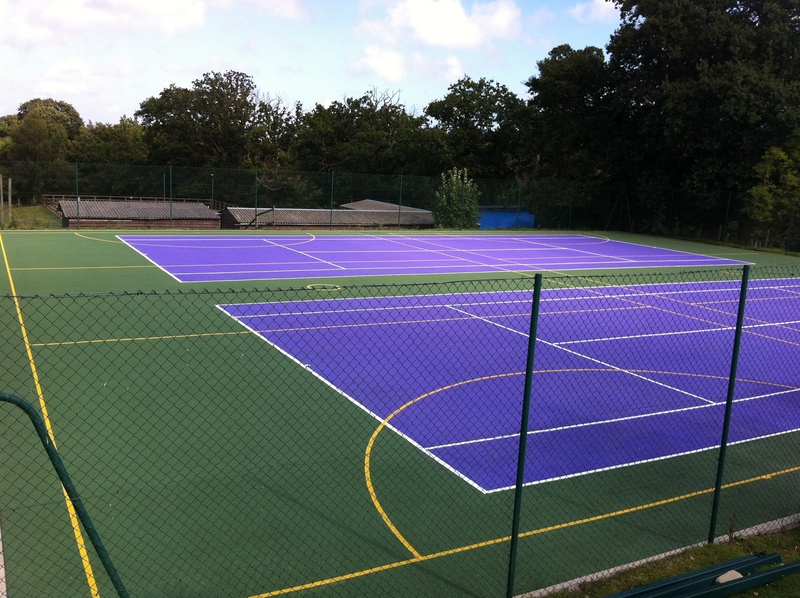 For example a typical MUGA could be a 5 a side football pitch that can also be used for basketball, hockey and athletics. Our team of experts are available to help and advice on the best use of your space. We also offer a number of extra features with a range of designs including MUGA fencing and MUGA lighting to suit different uses for the area. It’s totally up to you how you want to use the space, we can even include colourful designs in anti slip paint to make sure surfacing vibrant and exciting. 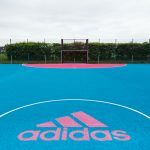 There are a few different options to choose from when installing multi use games area surfacing, these include: porous macadam, polymeric rubber and artificial grass. 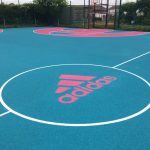 Each of these materials has individual qualities which suit different sports, so you can choose the best type of surfacing based on the sports you want to play. Having a safe and high quality sports facility is very important in schools and clubs. This is why we add MUGA painting to these surfaces to enhance the grip and traction, making the flooring much more slip resistant. These coatings are available in many colours including red, green, purple and blue so you can fully customise the appearance. 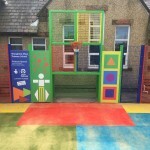 We are also able to customise these MUGA services and created a colourful paint design which is exactly what you want. Popular sports which are played on all purpose facilities include tennis, netball, basketball and football. Anti slip paint coatings and professional line markings can also be applied for these sports to ensure safe and accurate game play. This is also designed to meet SAPCA requirements as well as improving the performance and safety characteristics on the surface. 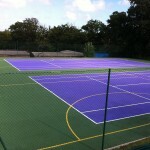 Another of the MUGA services we offer is cleaning and maintenance. It is vital that you keep your multi sport facility in top condition by looking after it properly. Depending on the surface type, this multi use games area maintenance could include pressure washing, distribution of rubber infill for artificial grass, and chemical treatments to prevent contamination from moss and algae. This regular maintenance can help improve the durability and longevity of your surface by maintaining the original quality and ensuring that it remains safe and meets all the relevant accreditations. In some cases it is necessary to completely resurface the area if it is in very bad condition; we also include this as one of our outdoor activity flooring services. Maintenance costs for an all purpose facility also vary depending on the specification and conditions on site, as well as the location and access to site. We’ll be able to advise you on costs for any work required at your facility, so feel free to ask should you need more information. Whether it’s just a simple cleaning service, or you think a full renovation will be required, our team are happy to help. If you send over some photos of your existing court we’ll be able to decide what is needed. 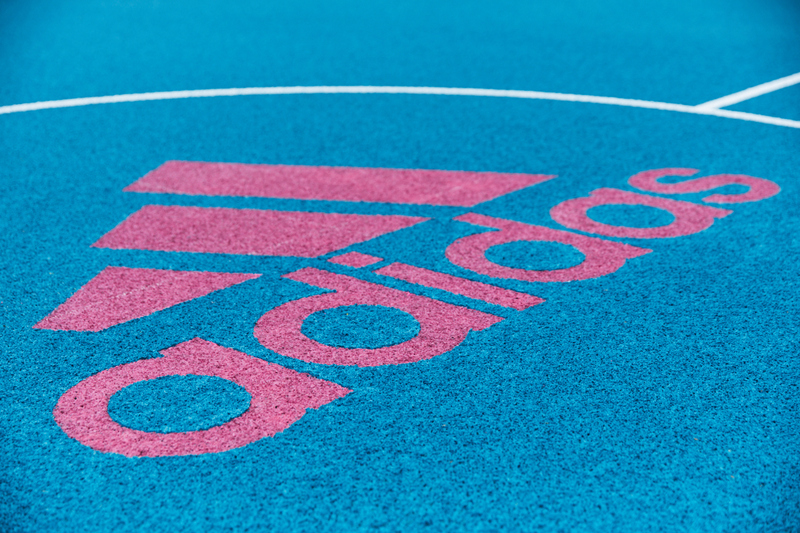 The photos below show a recent project which was carried out by our team alongside Adidas. 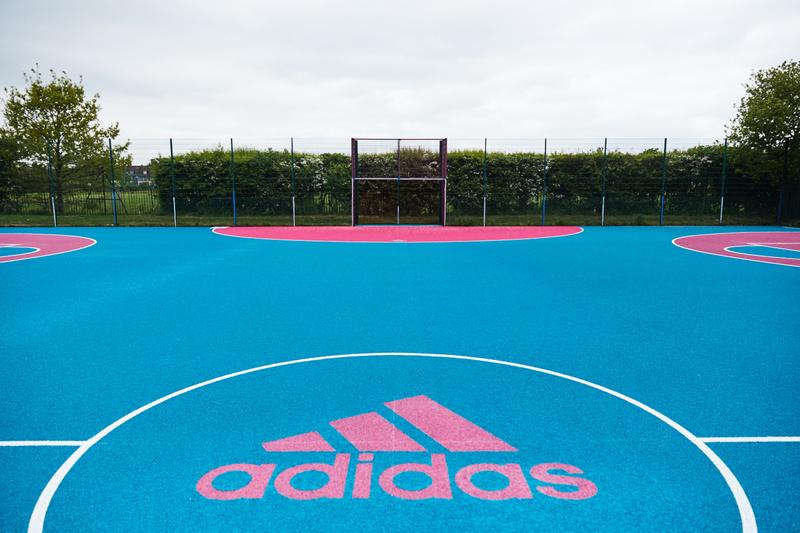 This is a polymeric MUGA court which was installed as part of an Adidas initiative to improve local sports facilities. We feel this is an excellent project to be a part of as we are passionate about improving sports provision in communities, particularly for children in schools. 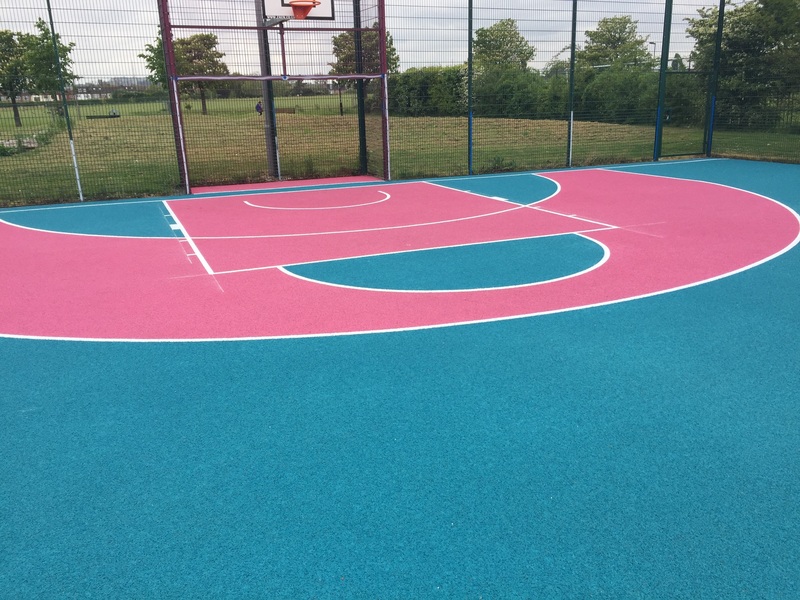 This particular process involved the full installation of a polymeric EPDM rubber surface in a pink and blue design. 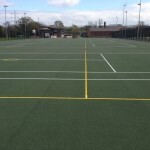 Line markings were added for use with a number of different sports including basketball, netball and football. There are going to be more projects similar to this carried out across the UK at various locations to help improve health and activity. 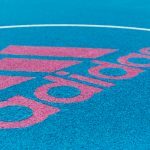 Being physically active is a very important part of life, both for children and adults, so it’s great to see large brands like Adidas being involved in this. A popular surface type that we install is the Multisport synthetic carpet which is available in a number of bright colours. This specification is a needlepunch artificial turf design that is perfect for lots of sports and activities due to its versatile playing qualities. Because of its manufacturing process, the artificial turf carpet is extremely porous so these facilities can be used in all weather conditions without becoming damaged. 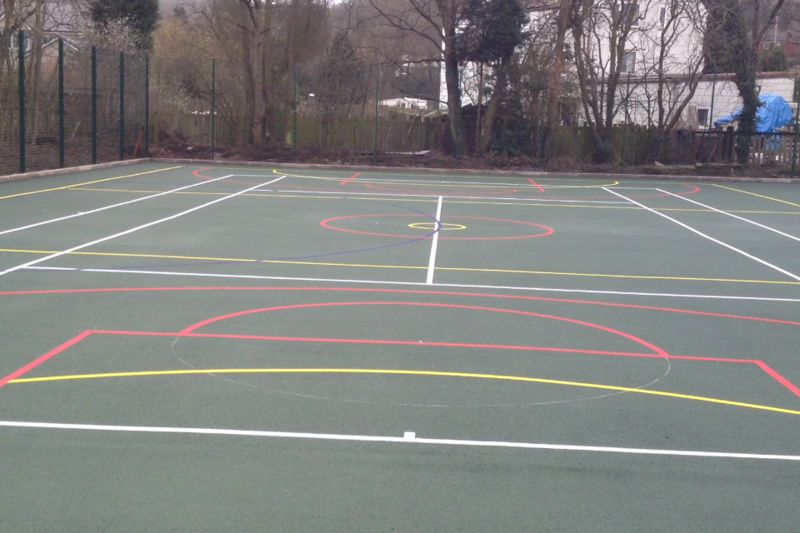 Take a look at this video which shows one of our recent projects, installing a Multisport synthetic MUGA at a school. 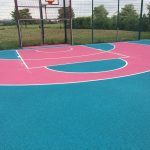 The clients chose to have the surfacing installed in a multi coloured design so it could be used for different activities and games. If you are interested in any of the professional services we offer for multi-activity facilities, please feel free to contact us today through the enquiry form. 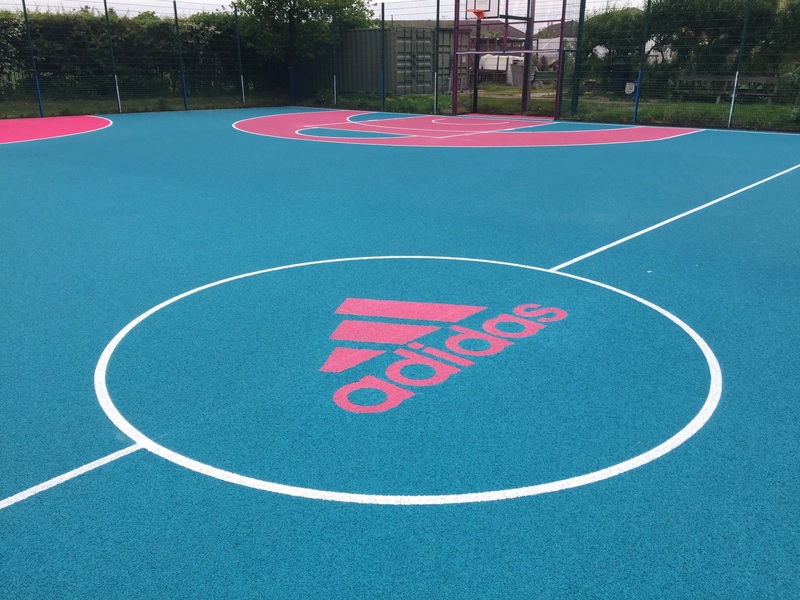 Our experts have worked on numerous projects throughout the UK with schools, colleges, universities and public sports facilities to create bespoke designs and install top quality surfaces. We would be happy to answer any questions you have regarding surface types, costs and maintenance for outdoor sports courts. Just let us know which service you are looking for and we’ll discuss this in more detail with you as soon as possible. During the process of multi use games area construction our specialists will carry out every stage of the work to ensure a perfect end product. This includes preparation works for the existing ground, laying the chosen surfacing and adding any additional features which might be required. The sizes and designs for each project can vary and be altered to fit your budget, and we’ll make sure it stays affordable. 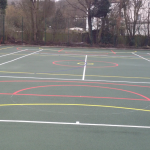 The costs and prices for carrying out installation and cleaning can vary greatly depending on the specification of work and MUGA services which need to take place. 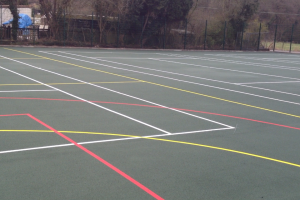 For hard courts, we will add MUGA line marking using anti slip paint to enhance the playing qualities. If you have an existing surface which required a renovation, applying new markings could be just what is needed. Prices for constructing a multi sport facility differ as a result of a number of factors including the area size, surface specification, location of the project and access to site. You can manage the cost of sport surfacing construction and cleaning through a few different options including the type of flooring and the extra equipment you have installed such as floodlighting and fencing. This will help to keep the price affordable while still providing a great quality sports facility for your organisation to enjoy. You can have surface testing carried out to assess your facility and outline any key areas which need looking at. These tests could include anti slip checks, water drainage assessments and ball roll testing. This will help determine an appropriate cleaning and maintenance schedule which focuses on services for problem areas to keep costs down. Regularly looking after your sport surface with an appropriate maintenance plan can help keep it in top condition and prevent the need for expensive repairs and resurfacing in the future. It’s important to choose a reliable contractor for construction and cleaning of activity facilities so make sure you get in touch with us via our enquiry form so we can send you over some further advice and an idea of costs for the work you’d like us to do. This video below shows details of an artificial grass MUGA pitch that we built in London. 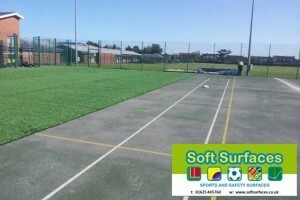 The surface was installed in the latest innovation of rubber infilled synthetic turf carpet which provides ideal playing characteristics for football and rugby. Pupils at the school can now enjoy a multipurpose sports surface which is suitable for use all year round. Please contact us for some more information on how these facilities are built. 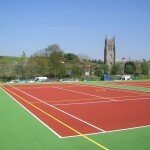 We can gladly send you over some case studies and product sheets with further details about the MUGA services involved. Synthetic turf is a popular specification for many schools and clubs as it offers an all weather alternative to real grass. As experts in the installation of sports facilities, we have completed projects in various specifications and MUGA dimensions. Our team work with schools, sports clubs and many other organisations to create top quality outdoor activity areas. These can be designed to suit a wide range of playing qualities for different sports like football, netball, hockey and tennis. We are even able to fit multi use games area fencing to keep the whole facility completely secure during use and out of hours. You might also want to use the space as a multipurpose play area which is suitable for sport as well as lots of other fun games during break times in school. This is a popular design for primary schools and we offer plenty of colour options and designs which are perfect for these areas. Please contact us if you would like to find out more about the costs of MUGA services for a particular facility you’re thinking of having built. We would be happy to discuss our prices with you and offer a quote which will be perfect for your budget. Simply complete the enquiry form on this page today and one of our experts will get back to you as soon as possible. 1 What Does MUGA Stand for?